Pythiosis is a systemic fungal infection that thrives in yeast rich and immunodeficient systems. Caused by a fungal-like aquatic organism called Pythium insidiosum, this organism is not a true fungus, but behaves somewhat similarly. It exists in stagnant water or on grasses that have been exposed to the stagnant water. Although many dog owners have never heard of this water borne plant pathogen, we believe it is more common than vets or researchers realize. No reporting of animal pythiosis cases is required. It is becoming more resistant and it’s also moving further north (some cases as far north as Arkansas, Washington State, and North Carolina). Dogs are often infected by swimming in water containing the p. insidiosum organism. It is therefore more common in humid and swampy areas where water stands for long periods of time. The spread of Pythiosis can be explained by the fact that the spores can become airborne in high winds. Wherever they land, they may lay dormant for long periods of time until activated by rain or heavy dew. Although many dog and horse owners have never heard of this water borne plant pathogen, we believe it is more common than vets or researchers realize. No reporting of animal pythiosis cases is required. It is becoming more resistant and it’s also moving further north (some of our cases are as far north as Arkansas, Washington State, and North Carolina). There are two ways Pythiosis presents in dogs. Cutaneous (pythiosis of the skin) is visable, with lesions that may have pus filled nodules and draining tracts. Some dogs are affected in more than one area. The lesions differ somewhat from what is common in the horse. In our experience, kunkers (necrotic, sometimes calcified, pale material that resemble bumpy rice kernals) are not present in Canine lesions. We have found the Sub-cutaneous cases to be much more common. Most common of the sub-cutaneous type of Pythiosis is gastro-intestinal although it may also infect the brain, lungs or sinuses. Symptoms of stiffness, head pain, fever, coughing and swelling of the sinuses may be seen for the latter. Symptoms of Gastrointestinal (GI) may include fever, vomiting, diarrhea, weight loss, abdominal mass and pain and enlarged lymph nodes. Unfortunately, once symptoms appear the disease has been present for some time. Canine Internal Major’s Solution (Formerly Fungus Free Plus) 4 oz. Use Major’s Solution™ Internal formula (formerly Fungus Free Internal) for the duration of the disease. Dosage is just one drop per 10 lbs, twice a day. For both cutaneous and sub-cutaneous. 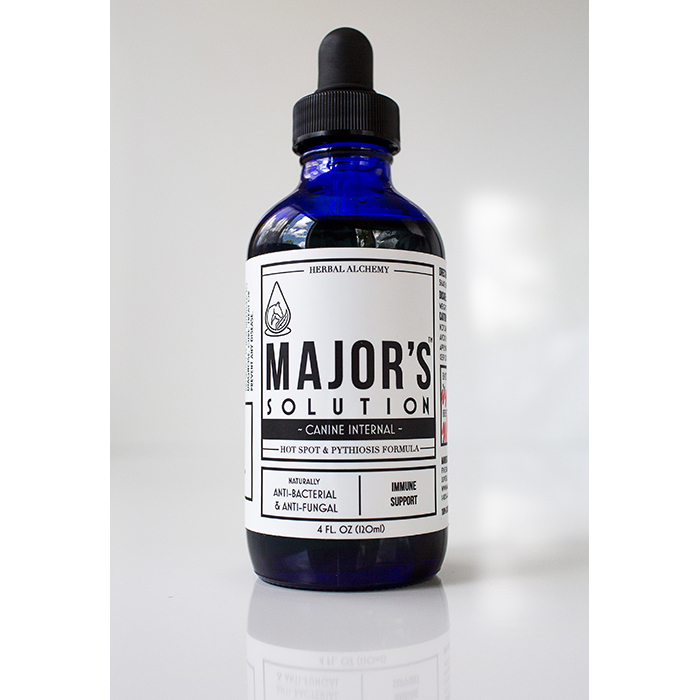 Use Major’s Solution™ Topical formula (formerly Fungus Free Topical) 2-4 times per day if dog has cutaneous lesions. Bandage if possible. For large areas some choose to use a t-shirt. PavLab has a 50% success rate with canine pythiosis. We suggest a Sea Salt solution for cleaning the wound. Dilute 1 teaspoon sea salt in hot (not boiling) water for every 8 oz of water. A spray bottle works well for ease of use. No need to make a fresh solution every time, it will store well in a spray bottle. Pat dry as possible before applying Major’s Solution™Topical. Viva paper towels are great to gently clean wounds. Twice a day bandage changes are recommended in the beginning. 4’’ square gauze sponges are recommended for type of gauze. Apply Major’s Solution™ Topical directly to the wound and the gauze. Duct tape or Elastikon can be used to secure bandage and can be an invaluable tool. If you suspect your animal has pythiosis, please call us today so we can coordinate the best and quickest care possible.